This information was shared with us by a helpful reader and a former Bain consultant. Read on for an insider’s perspective on recruiting at a top consulting firm, and the key differences between university recruiting and experienced hire recruiting. While the information is particular to Bain, many of the methods will be similar across big consulting firms. Boutiques firms will differ, given the limited scale of their hiring. 1. Probably the toughest part of the application process is passing the initial screening process. As an example, a large Bain office would receive around 3000 applications and narrow it down to about 100 for the first interview. So you would have to be at the top 3% to even get the interview. 2. In deciding who gets the interview, Bain has a points system for all applicants. Key categories include academic, work experience and extracurricular activities. Bain may be the only firm out of the Big 3 to use this method. Those with top academic marks but crappy work experience and extracurricular activities would still get interviews at McKinsey, for example. We’d have to disagree here. Most companies are looking for diverse qualities in consulting resumes, which usually are a combination of school, work, and miscellany. 3. Whenever there is a borderline case, there is an internal team meeting to discuss who should get the interview. At this stage, the process becomes more random and you might as well flip a coin to find out your fate, because this is subjective and susceptible to many external variables. 4. Without very strong academic marks/GPA, or a brand name firm (like a Goldman Sachs internship), it’s an uphill battle. However, interesting experiences that reflect entrepreneurship, distinctive leadership, and the like, will help a candidate standout. 1. This is extremely difficult given the current economic conditions. In short, they will mainly rely on the supply of undergrads and post-MBA applicants from the traditional recruitment programs. We wouldn’t be too worried. While most firms have reduced hiring, companies are always looking for talent. You will need to work harder, however. 3. Somebody on the inside recommending you would double your chances of getting the interview. 4. If you submit your application via the campus recruiting program and don’t get through, you won’t be blacklisted without a chance of getting in through lateral hiring. Your resume will simply be thrown out, and you’ll have a fresh slate for experienced hire recruiting. However, if you get an interview through campus recruiting, then it is more likely that they will keep your records for the future. If this is attempt #2, the key is to tell a different story. Focus on what you’ve done well in the interim. Want more insider tips on acing the interview process? 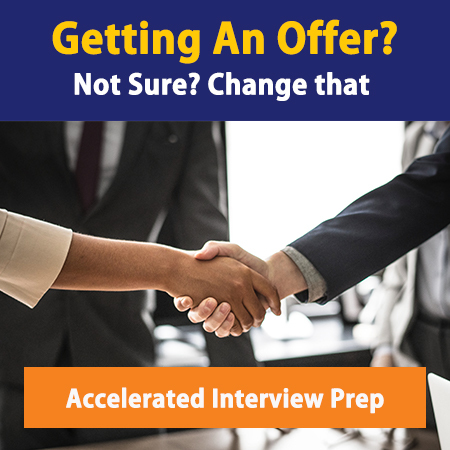 Our Consulting Interview Bible will break it down for you – from what interviewers are really looking for in the fit interview to how to structure your answers during the case interview, it’s a comprehensive guide to take you all the way from interview to offer! Consider our interview prep or resume prep as well! I have few related queries pertaining to Management Consulting career switching from Engineering Professional area. * Is acquiring MBA, a pre-requisite necessity for Consulting career ? * Please identify the mainline personality, characteristics, skills and knowledge to be pursued before getting into the Organization / Corporate Functions and commit duties uprightly. What are the pre-requisites in terms of his/her Personality & Characteristics skills towards achieving successful Consulting Career in leading companies ? Associate / Consultant position ? Kindly extend your suggestion on this. your reference and I appreciate if you could pin-point certain ‘good’ & ‘to-be-improved’ points. Thanks and I look forward to your honest suggestions / ideas. Question for you. I recently graduated from Georgetown University with a Master’s degree (not in Business) this past May. Even though I just graduated a few months ago would I still be put into the pile with experienced hires? And if so…..would my resume be given more leeway for having less job experience? I am only 25 and graduated from undergrad in 2006. It’s an awkward spot since you graduated more than 3 years ago and have a Masters. I’d say you’d probably be put into the “experienced hires” pile, depending on where your resume was sourced (eg, did you submit it on-campus, directly to a recruiter, etc). Hope that helps. I am going to be graduating from Seton Hall University December of 2009. I will hopefully complete the degree with a perfect 4.0 while having double majored in both Finance & Management. Additionally, I obtained a masters level certificate in Entrepreneurship and a Black belt in Six Sigma. I am an Operations Manager with Allstate for the past 6 years. Not knowing anyone in the consulting industry and not coming from NYU, Harvard, Columbia, etc, I am fnding it very difficult to get in for an interview with anyone. I have been at it for almost 6 months now. I network with everybody under the sun, I apply for jobs on company sites, I attend seminars, I do everything I am supposed to do, and still, BIG OLD GOOSE EGG????? What challenges do director level candidates face when attempting to land a role at a top tier firm? Should one expect a horizontal move? Or is it better to target roles at the project leader or consultant level? Also, do top tier firms shy away from recruiting professionals with 10+ years of experience that is focused in fields other than management consulting? If so, what are your suggestions to changing perceptions? Technically speaking, I have served in a consultant role working as a group director of strategic media planning for 2 of the top 3 global advertising networks over the past 13 years. I am confident the skills I have developed translate well to management consulting as I am experienced advising clients, managing projects, developing new business, leading teams, and directing strategic plan development and execution for Fortune 500 & 1000, start-ups, and turnaround businesses. I’ve also increased my marketability by attaining a dual concentration MBA in Finance and Strategy/Entrepreneurship from the Cox School of Business at SMU while maintaining full time employment. I am very interested to land a role with a top tier firm so your advise is greatly appreciated. Being in Finance for the past ten years, I can tell you all the bad news. Companies such as Bain only hire from top ten schools. Even more than that, they prefer to hire from the Ivy League. If you are not from an Ivy League school, you need to stand out in a big way. This means that you must have been a Rhodes Scholar or a top nationally recognized athlete. My advice is to stop wasting your time and get experience. Even if you begin your career at a low level firm, you can fight your way to the top. If you are the best performer, you will eventually make it, it will just take a bit longer. Degrees at public universitys or second tier private do little to get your foot in the door at firms such as this. For the first statistic, you mean 30%, not 3%, right? I’m interviewing with Bain for their ACI position in a few days. They informed me that the first round would be 2 30 min case studies. I have 3 questions to this. 1. What type of case interviews will they give me (market sizing/business case/brainteasers or some combination)? 2. For a first round, I always thought that they would at least have some competency based interviews. However, judging from the email they sent me it looks as if it is entirely case based. Should I even spend a lot of time preparing for behavioral/fit questions? 3. I applied through early recruiting. Do you know if there is any difference between early and regular recruiting (besides the obvious difference in time)? Anyways, thanks in advance. This site has helped me a lot including landing this first round interview. I have the same question, I am in a director level role and I am very interested in Management Consulting, but I am concerned about taking a step back from a role and compensation perspective. Any thoughts on Raymond’s question (and mine as well)?